Stewart Filmscreen makes the screens used in virtually every professional screening room in Hollywood. 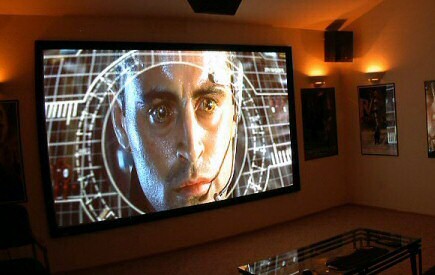 If you're building a home theater, there's no better choice than a Stewart screen. It is critical that you match your screen to your projector. Not only that, but you also need to match it to your room and to your desired use. For example, let's say you've got the guys over to watch the game. If you have a white screen, you'll need to turn off all the lights to get a picture that's not washed out. Watching a movie in the dark with your sweetheart may be all right, but is that really how you'd like to hang out with the guys? We specialize in front projection home theater and have designed hundreds of great looking theaters in real-world situations. We've spent countless hours evaluating screens and projectors from nearly every major manufacturer. We'll work with you to find the right Stewart screen for your theater. In addition to home theater screens, we have a full line of projectors, audio and video components, speakers, home theater furniture and accessories. Browse the rest of our site to find out who we are and how we do business. We know that if you're shopping on the Internet, you're probably looking for the best price you can find. Please allow us the opportunity to provide high-end retail store knowledge and experience and the Internet price you're after. Stewart screens can be made with a number of frame types and screen materials. The following 3 surface materials are used in most of our Stewart screen installations. Stewart Filmscreen's FireHawk has won more industry awards than any other screen material. FireHawk is a dark gray material that has a 1.25 gain, which reflects more of the light from the projector back to the viewer, and increases the over-all brightness. This combination keeps most of the ambient light in your theater from washing out your picture. It is an incredibly versatile screen that can give an amazing image, even in a room with all the lights on. Contrast is one of the first things you perceive in an image and the Stewart FireHawk gives you more contrast than any other screen, regardless of the projector! Stewart's new GrayHawk RS (reference standard) is a neutral density gray screen material that has been certified by the ISF as a true reference screen material. With it's .95 gain, GrayHawk works great with brighter projectors, or smaller screen sizes. Stewart's StudioTek 130 is the industry's standard reference screen. StudioTek 130 is a matte white material with a 1.3 gain and is ideal for low-output projectors and rooms with complete light control. The StudioTek 130 also works great with 2.40:1 widescreen anamorphic systems because of its brightness uniformity. The Stewart Luxus Deluxe ScreenWall is the most popular fixed-frame screen in the industry! It's beveled frame with Stewart Filmscreen's VeLux™ black trim dramatically sets off the image for the maximum impact. The Luxus Deluxe comes in any size you need and works with all of the Stewart front projection materials. 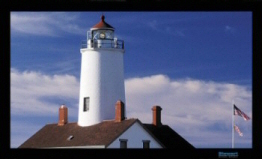 It also is available in the 2.35:1 aspect ratio for widescreen anamorphic systems. Bring professional style and elegance to your business applications. Save space and assure a professional atmosphere with Stewart's custom seamless electriscreens. Stewart's motorized roller system provides a quite, reliable screen operation that can be activated by a switch, infrared or remote control, or a projector screen trigger. Tab-Guy tension system is standard in order to maintain screen flatness and control edge-curl. Would you like to get rid of those annoying black bars above and below your movies? With the Stewart CineCurve and a 2.35:1 anamorphic system you can! The CineCurve delivers the full impact of your movies with an immersive experience second to none. And when you're watching 16:9 HDTV or 4:3 content, masking panels glide in from the sides to set off the image perfectly. The is just no better way to experience your movies than with a True Widescreen system. Call us today to find out why we are so impressed with this system. We've shown you the more common Stewart screens and materials, but if you're looking for something you don't see here, please email or call. We are a fully authorized Stewart dealer and can provide you with any Stewart Filmscreen product you need.